Created during the Silver Age of comics by Gardner Fox, Carmine Infantino, and Bob Kanigher in 1956, Barry Allen was the second hero in the DC Universe to use the Flash name. A forensic police officer, after a chemical accident, began to access and channel the extra-dimensional energy of the Speed Force, making him capable of moving and running at very high speeds. Now known as the fastest man on earth, The Flash is also one of the founding members of the Justice League. 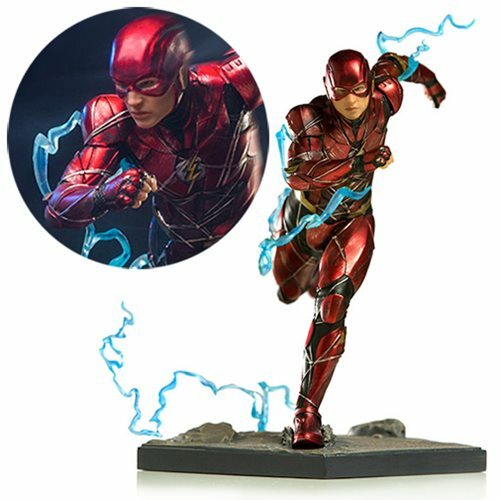 The Justice League Movie The Flash 1:10 Scale Statue measures about 6 3/10-inches tall. The hand painted statue is made of polystone. Ages 15 and up.